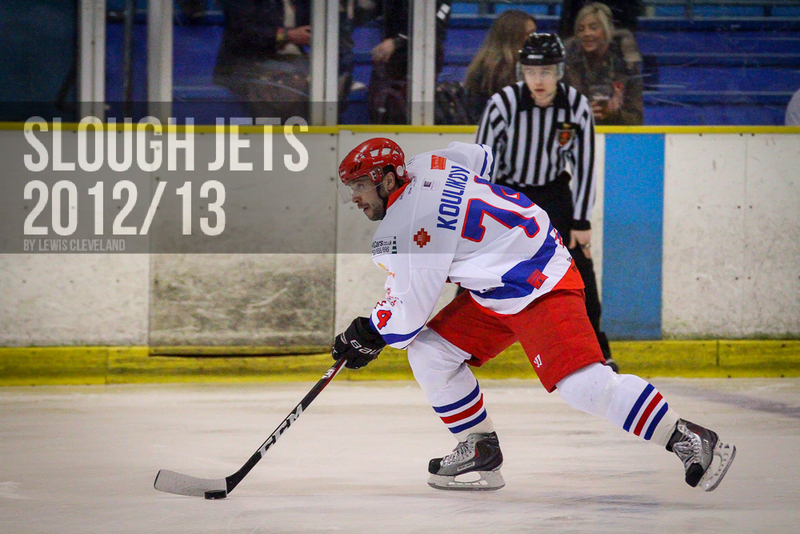 After a long journey down Manchester Phoenix took to the Hangar ice to take on the Slough Jets with league points on offer. Manchester were put ahead after just 2.51 when Luke Boothroyd scored but Mindy Kieras had the game levelled at 5.48 when he finished from Slava Koulikov. After killing off the game’s first penalty the visitors were back shorthanded again soon after but couldn’t repeat the penalty kill as Darius Pliskauskas scored at 15.17 to put the home team ahead, a lead which they held until the interval. Richard Bentham scored the leveller at 25.22 making it 2-2 but after a spell of penalty killing Ales Padelek beat Stephen Fone at 34.35 to put Slough ahead 3-2 and they held the lead until the end of the second period. The third period saw Kamil Jarina tested from all angles as the visitors fought desperately to equalise the game. As time ticked away Jarina continued to turn away shots but eventually with 5.05 left on the clock Michal Psurny levelled the game and Slough took their time-out at 3-3. The remainder of the period ticked away with no further scoring and the teams went to overtime. 4 on 4 sudden death overtime saw Slava Koulikov adjudged a tripping penalty at 60.25 and Manchester set about the two minute powerplay. With the home team getting ready to return to full strength Frankie Bakrlik made it 3-4 with the overtime game winner scored on the powerplay and secured the extra point for the visitors. 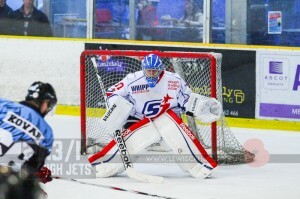 Midweek action was the first of two games for Slough against Milton Keynes as Planet Ice MK hosted the first of the two. Mindy Kieras netted the game’s opening goal after just 121 seconds, finishing from Dan Davies and Slava Koulikov to make it 0-1 and with both team failing to convert a powerplay chance in the opening period the first 20 minutes closed 0-1. The second period passed by free from penalties but with a goal each. Defenceman Lukas Zatopek netted the equaliser at 31.02 but Frantisek Bakrlik made it 1-2 with his 38.45 strike from Mindy Kieras and the second interval was taken with Slough 1 goal ahead. Slough fell foul of penalty trouble in the third period, first an icing infraction call then tripping before Adam Greener and Chris Wiggins came together earning 2+2 for Slough and 2+2+2 for MK. A second icing infraction penalty allowed Nick Poole to equalise the game with a powerplay goal at 52.45 and with 2.25 left to play Kamil Tvrdek netted the go ahead goal prompting the Slough time-out. Despite 44 seconds of empty net from the visitors they failed to find the equalising goal and Milton Keynes won the game. 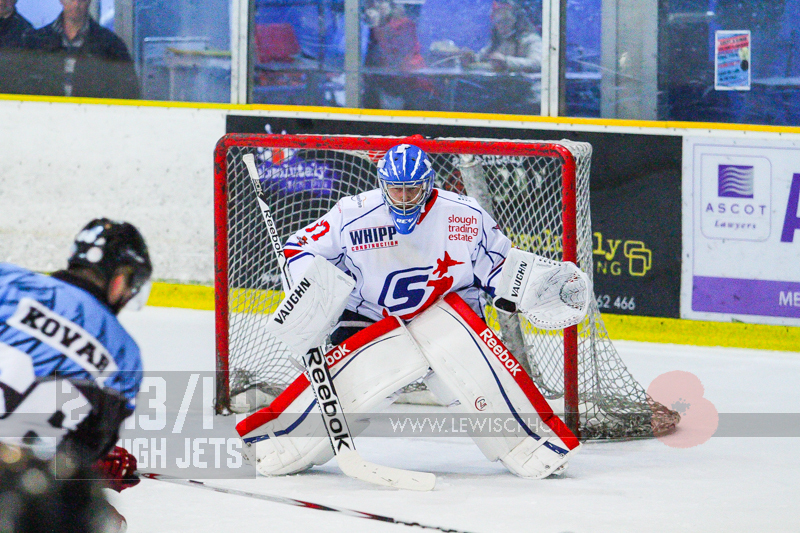 Following a midweek game at Milton Keynes it was Slough’s turn to host as the weekend started with the Jets taking on the Lightning at the Hangar. Slough and Milton Keynes got off to good starts but it was the home team defence and netminder who were the busier of the two with the visitors pounding Gregg Rockman with 17 shots which he kept out while Mettam did the same with the 7 he faced. In the middle period the crowd were treated to some extras when Adam Greener and Chris Wiggins came together and the spark that created saw the game’s opening goal which Mindy Kieras scored on a powerplay chance at 31.14 while Grant McPherson sat out at slashing penalty. Neither team found a way past their opponents’ netminder in the remainder of the period and the home team enjoyed the lead at the interval. The second period got off to a great start for the home team as they doubled up the lead through Matt Towalski, scoring on his former team 2.02 into the period. Slough picked up at icing infraction penalty which they killed and ended the game killing a penalty for the final 14 seconds, which Milton Keynes attacked with the extra skater but Slough closed out for the shut-out win. 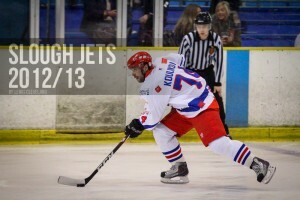 Slough Jets welcomed Sheffield Steeldogs to the Hangar and the home team showed fireworks to equal anything shown at Upton Court Park. Slough played out a perfect 4-0 opening period to effectively seal victory after the first 20 minutes. Blaz Emersic broke away with the home team shorthanded and make no mistake to open the scoring at 10.31. Michael Bowman made it 2-0 at 13.05 and Slava Koulikov netted at 16.36. Doug Sheppard scored with 53 seconds left in the period with a powerplay strike to complete the 4-0 period. Nicky Lewis pulled a goal back for Sheffield at 22.34 but Shaun Thompson scored at 30.48 to set the home team scoring again. Darius Pliskauskas took just 4 seconds of a powerplay to makde it 6-1 at 32.26 and Thompson netted his second, this one on a delayed penalty with 15 seconds left in the middle period despite being hooked as he broke in on goal. Both teams iced their back-up netminders for the closing period. Slough eased off with the result secured but still managed one more goal when Jan Krajicek scored 4 seconds into a powerplay at 53.33.